"Hello, I have some DNxHD files with a .mxf extension on them which I would like to bring into After Effects. I've never done this before. I also notice that the audio left and right are separate channels. But I don't even care about the audio, I just want to bring in the video. How would you do this? According to the above description quoted from the current forum. We can clearly find that he seems to get a bit confused when importing Avid DNxHD MXF footage into After Effects for further editing. Indeed, in general, After Effects does support mxf import or export, but has strict requirements only limited to P2 and XDCAM, and obviously DNxHD codec is excluded. As someone suggested, in order to get your DNxHD .mxf media imported into After Effects smoothly, you'd better export the MXF files from your Avid as a Quicktime basic codec using the "Same as Source" option. In AE, you can render directly to DNxHD in a Quicktime container for fast-import back into Avid. However, this way will be a bit time-consuming and somewhat complicated. Fortunately, after multiple testing we've figured out, in order to get around all these issues for good, the best solution is to transcode DNxHD. mxf to MPEG-2, the optimal video format when working with all Adobe products. In order to fulfill this task perfectly, I'd like to highly recommend Brorsoft MXF Video Converter, which enables you easily convert DNxHD .mxf to MPEG-2 for editing smoothly in After Effects as well as other famous codecs like Apple ProRes, Apple Intermediate Codec, DNxHD, etc to seamlessly fit for FCP, Premiere Pro, Avid Media Composer. iMovie and more NLE systems. 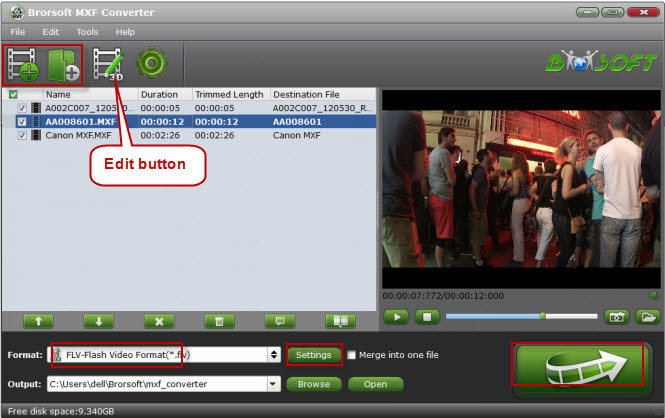 If you are a Mac user, you can also turn to the Brorsoft MXF Video Converter for Mac. Download the software and this article will guide you through how to rewrap and transcode DNxHD MXF to MPEG-2 for Adobe After Effects. Click File > Add Video/Audio to load DNxHD MXF files to the program. You can also directly drag the video files into the program directly. Tips: Click the "Settings" icon and you will get a new interface named "Profile Settings". You can change the default codec, bit rate, frame rate, sample rate and audio channel according to your needs and optimize the output file quality. Finally, simply hig the big Convert button to start converting DNxHD MXF to Adobe After Effects CC/CS 6 friendly video formats. Within several minutes, you can find the converted file on your computer by clicking the "Open" button. And then you can import the converted files to Adobe After Effects CC/CS 6 easily.